Like a character from Sin City, I must be a glutton for punishment. I’ve already talked about how much I hated the movie, but I was recently forced to revisit its sordid world for an illustration assignment. A regular client — Washington D.C.’s City Paper — called up with a story about the owner of a strip joint and his run-in with an undercover cop. Words and threats were exchanged, along with a lot of male posturing; the whole scenario called out for the Sin City treatment. I proposed the illo show the club owner and some strippers facing off the undercover officer and some other cops, in the Miller “style”, with some type treatment to drive the point home. 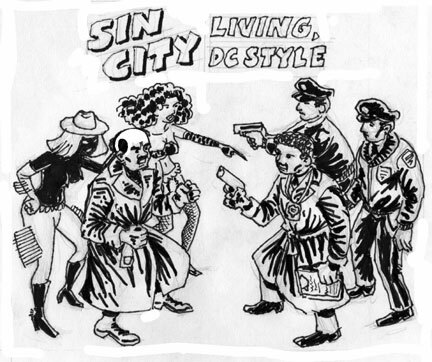 When the a.d. mentioned that there was a D.C. goodwill campaign going on that promised “city living, d.c. style,” the whole concept came together. Frank Miller is an incredible conceptual artist and craftsman. It’s hard as hell to imitate what he seems to do so effortlessly. I still hate Sin City. I like the concept sketch better. May you rue in Miller Hell for all eternity. What is UP with them black tittyballs? May you rue in Miller Hell for all eternity. A.D. gets the final word… except for here! thanks, man! that’s high praise, coming from a prize-winning illo vet like yerself!